Hey all you awesome people! Today is a very special day. Today, I get to share with all of you an amazing Q & A with P.C Cast (whom I adore). 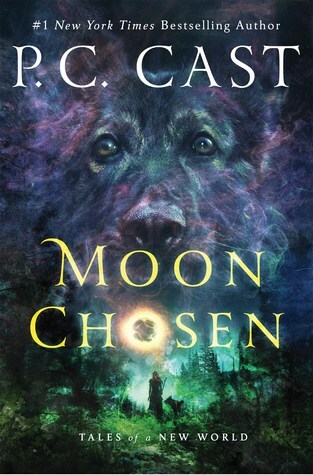 If you’re a fan of House of Night or the Partholon series, or even a newbie falling in love with Moon Chosen, today is the day for you! So I got to submit a bunch of questions, along with a host of other bloggers, to this amazing, beautiful woman. And SHE ACTUALLY ANSWERED THEM! Can you believe that? I died a bit, okay, I died a lot. I fangirled, and screamed, and cried, and went to my happy place. 1. What 3 words would you use to describe your book? 2. Writing a fantasy book seems like such a daunting task. How did you plan out the world? It is a daunting task, indeed! Well, the inspiration for the plot came from the bond between my amazing personal protection dog, an Eastern European German Shepherd named Badger, and me. He’s my hero, my Warrior, and my confidant. He loves me unconditionally and would give his life for me. Then a move to the northwest (Portland, OR), lit my imagination on fire. This part of the world is so incredibly beautiful! So, I had my setting and my basic plot inspiration. Then I called one of my best friends, Christine Zika, who was the editor for my Goddess Summoning Series. She and I had an old fashioned brainstorming session, and from that I wrote a loose outline. I did a lot of research about the NW (including fabulous hikes! ), and of course I asked for my dad’s help with creating the biology of my post apocalypse world – and then dove in! 3. I’m intrigued by the idea of a totally different world with animal allies and Earth Walkers. Where did you get your ideas for this book? Thank you for asking! The idea of animal allies and the bonds formed between animals, at first specifically canines and humans, was inspired by my bond with my working dog, Badger. I had something scary happen in my life about four years ago, and I decided to invest in a personal protection canine. I’ve always had a menagerie of dogs, cats, horses, rabbits, guinea pigs, etc., etc., but I had no experience with working dogs or German Shepherds. They delivered Badger, my personal protection canine, and the moment he and I met we had an immediate connection. It was like nothing I’d ever experienced before, and was so profound that I knew it must be the foundation for a new adventure – for me and for my readers! I, of course, had to include other fabulous canine familiars, as well as a variety of felines, equines, and many other surprises. The physical setting was inspired by my move to the northwest. The beauty and wildness of the landscape surrounding me set my imagination on fire, and as usual, I turned to my brilliant father who helped me extrapolate what might happen to our world if it had survived a series of massive solar flares that changed the atmosphere, topography, flora and fauna – as well as humans. Then I added a big dose of goddess magick! 4. Which do you find the hardest to write, the first or the last line of your novels? Why? Definitely the first. I always struggle with a manuscript until a little after the midway point, then it’s like I’m on a roller coaster that’s finally found its downhill track, and the rest of it speeds by – including the final line. 5. What scene in the book are you proudest of, and why? That’s a really hard question to answer! I’m very proud of this book, this world, this series – but if I have to choose one scene it has to be a scene between Mari and her mother – the one that happens after Mari calls down sunfire for the first time. It was one of the most difficult scenes I’ve ever written. I felt every word of it, and I am proud of every word. I can’t say more without giving away a major spoiler! 6. Thinking way back to the beginning, what’s the most important thing you’ve learned as a writer from then to now? To follow my gut, but to do it by using my brains and my experiences in the business. Also, to be kind to myself. Writers can have some very weird work hours. Sometimes I put in weeks of twelve hour days all in a row, and sometimes I take breaks in the middle of books to rethink plots, scenes, and characters. It’s easy to get down on myself during the breaks, and even after writing thirty plus books I have to remind myself that just because I’m not in front of my computer typing that doesn’t mean I’m not working. 7. What do you like most about the cover of the book? The gorgeous German Shepherd modeled after my dog, Badger who inspired the series! 8. Which part of the writing process do you enjoy more: Drafting or Revising? Revising! Definitely! I revise the entire time I’m writing. Then when I finally finish my first draft I put it aside for about a week, then gleefully go back and begin revising from page one! Creativity! And it’s definitely a super power. I’m surprised (and grateful!) over and over again as my creativity imagines new adventures and worlds and characters with which to fill them. Finishing SUN WARRIOR, book two in this series. Also, Kristin and I are going to begin a new YA series called THE DYSASTERS, which we’re super excited about! The first two books will be released spring and summer of 2018. And hard at work on a 10th anniversary House of Night surprise for our fabulous fans! Favorite Superhero? Wonder Woman and Superman – I love them equally. Fall Movie you’re most looking forward to? WONDER WOMAN!! But, it’s not out until 2017 (it was the first movie I thought of). If you could only eat one thing for the rest of your life, what would it be? PASTA!